What if we’re all bullfrogs? Some days are deep-pond days. When the afternoon sunlight is clear and warm and stretches lazily across the deck where you sit eating cake, truffles and braided raisin cake; when your head feels swampy from the springy perks in temperature and the richness of your coffee; on those days the smallest things will reveal the deepest meanings. Friday was a deep-pond day. I had been meaning to visit the ‘P’ family for weeks but holidays and school schedules kept getting in the way. It was all for the best. Friday turned into one of those days which required an escape from my usual routine of going home, cleaning up, and putting in a few more hours of work till sundown. I needed a break. So off the train to the small village, one stop outside Prague, and into the ever-open arms of Mrs. P, I literally ran. She’s been my mom-away-from-mom for two years now (one of several that I’m blessed to have here in Prague, actually. Life Tip: endear yourself to loving adults – they will scoop you out of messes you don’t even realize you’re in). The moment I walked through the door, I was given a second lunch (mucher better than the first, served in the school cafeteria) and a tall glass of Kofola. For those who don’t know, Kofola is the Czech version of Coca-Cola. It’s decent enough, though not as sweet as American Coke, and I have quite adapted to its gingery taste. I’ve known the P’s since 2010 and they’ve never failed to feed me into oblivion. After I finished eating the dumplings and sun-dried tomato-stuffed chicken, my water glass was topped off and Karel brought me a caffe latte. I met Karel when he was just sixteen. He has turned into a sharp, smart, driven young man studying at the most prestigious University in Prague, but I still see the sweet boy with mispronounced English showing us Americans all of the city’s oldest sights. His younger sister, Jana, is a darling. I gave her English lessons last year and she’s improved immensely, although I doubt I can take much credit. The four of us – Karel, Jana, Mrs. P and myself – lounged on the shaded deck around a wooden table covered with a colorful spread of desserts and coffee trimmings. The sunshine washed over us like cool waves on a tired beach. It’s hard to admit, especially for young people, I think, that we get tired. That we’re at the end of our rope. That we need a break. We are not the endless stores of energy that we thought we were in college (and now that I’ve given up the energy drinks and napping through Astronomy class, I’m beginning to feel it). It’s not just a physical thing. It’s emotional too. I feel old even saying this, but I’m learning how important it is to take care of yourself – of your whole self. This Friday afternoon with this lovely family was part of my treatment. Eventually, we left our chairs and moved over to the pond. “We have maybe twenty frogs in here right now,” said Karel. I didn’t make it all the way to the fish pond at the end of the garden. About a foot from the water’s edge I collapsed into the soft grass, barely able to see the water glistening in front of me. It was silky smooth and I much preferred lying on it to looking for bitty, web-footed jumpers. I looked at the glassy surface. All I could see was a pool of green, blue and brown rippling beneath golden fingers of sunlight. No frogs. 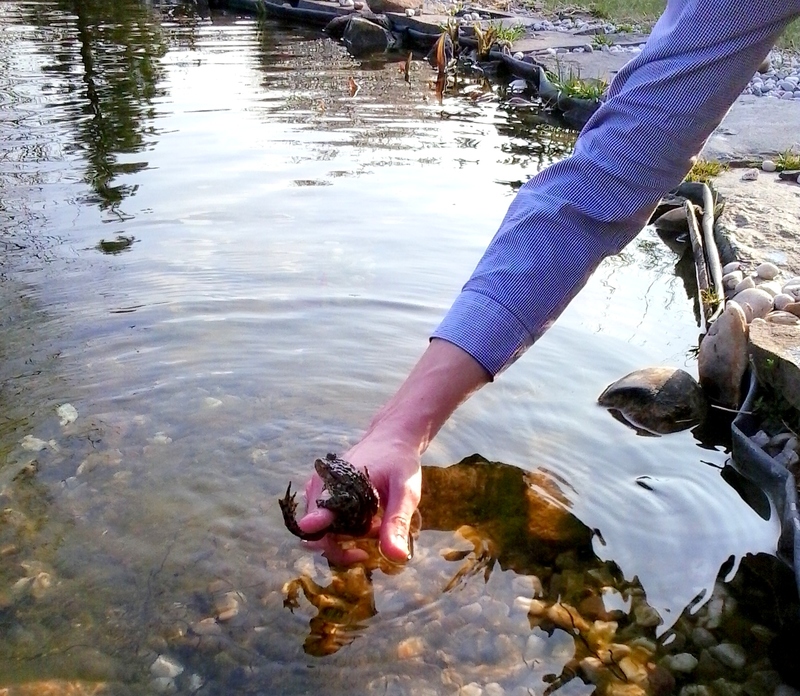 Karel reached his hand into the pond and pulled it out. Let me first say that frogs are not a creature I have a lot of experience with. Let me add that this was no petite, little tree frog. This was a bullfrog. It was massive. And as soon as I saw it, suddenly the whole pond came into better view. These green mammoths were swimming, darting and pawing at each other all around the basin. For a split second, I contemplated running away or bursting into tears, both of which are totally normal reactions and I judge no one for thinking the same way. I think at some point in my life I would I have been okay simply standing around the pool, counting them (we got to about 28 before deciding that we’d never find them all hidden beneath the scum and algae). But I’m realizing that I’m a different person than I thought I was. Time changes us and we don’t notice it happening till it’s done. 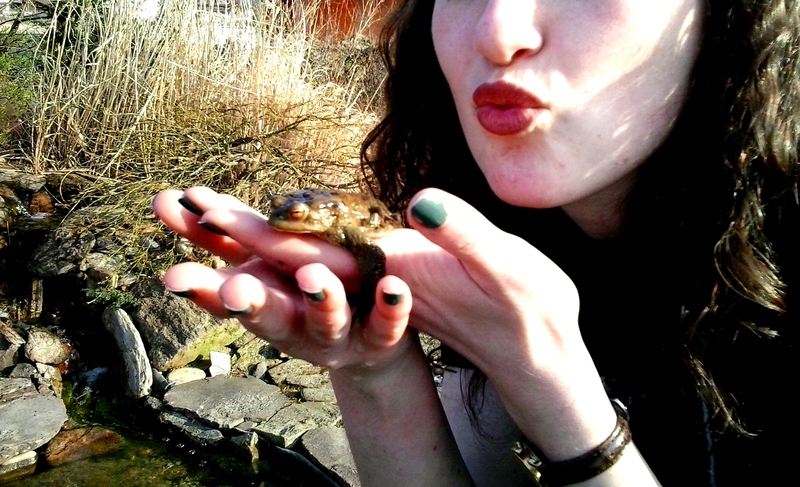 I’m realizing I’m now a kind of person who doesn’t mind frogs so much. Some of the frogs were dark green, others were nearly white with muddy brown speckles. None of them turned into princes, though Jana and I tried to convince them it was in their best interest to do so. Into the clear, cold water, my hand dove and reached for a chum. It was about half the size of my hand and slimy to boot. Pushing aside the wives’ tales about warts (isn’t that toads, anyway? ), I pulled out my very own croaker. He was gorgeous. He stayed still for about two seconds before diving back into the pond. Again and again, Jana, Karel and I coaxed and prodded frogs into our hands, sloshing them gently about before letting them return to their underwater homes. Some of them had surprisingly strong grips, and several sang sweetly for us before hopping away. I watched a dark green bullfrog soar through the water, a lighter, smaller frog clinging to its back, like Superman and Lois Lane. “They’re gonna have cute kids,” I said. “They’re gonna have 300 cute kids,” said Jana. She looked at me and smiled, not understanding that my question was sincere. “Why so many?” I asked. 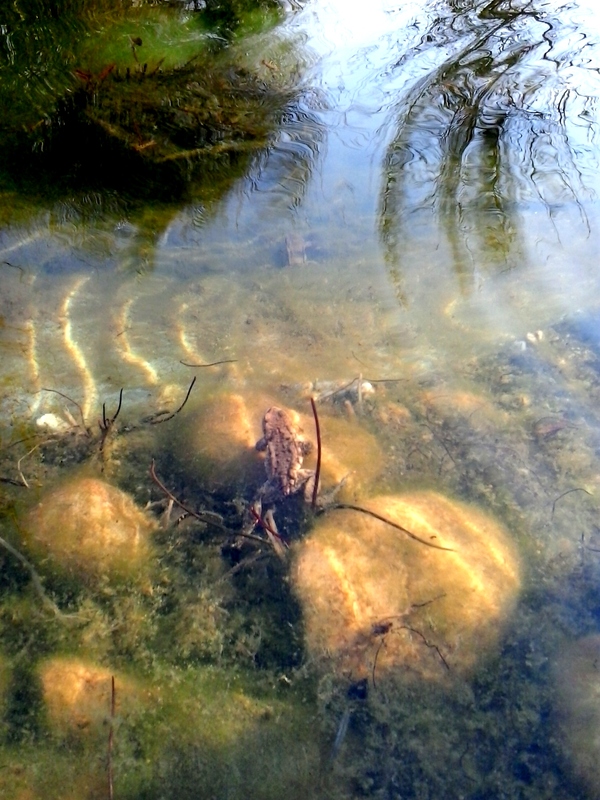 I looked at the bullfrogs below us. These were the lucky ones then. The ones who made it back just long enough to love somebody and produce heirs to their froggy world before heading back out into the great beyond to do whatever frogs do. Is this all there is? I wondered as we left the pond and retreated to another round of coffee, chocolate and fruit inside the house. Is it just this? Finding someone to hold on to? Is this what we live for? For a moment, the thought was comforting. How nice to be a bullfrog. Bad days, mess ups, failures can all be pushed aside because they don’t matter. All that matters is that we love and are loved by others. Please excuse my bluntness, but that mode of thinking is exactly what screwed up my Friday in the first place. Frankly, it’d be pretty depressing if love was all there was to this life, because I haven’t found another bullfrog yet (and I’m totally willing to settle for one that doesn’t turn into a prince). And, anyway, being loved by humans is a broken, fleeting blessing that comes and goes with the tide of human emotions and the ebb and flow of life’s unstoppable current. Just like the spring ends and the frogs return to their woods (to be eaten, most likely), so our relationships – fragile, imperfect, finite – will not be lasting, will not have an eternal significance in their own right. But the thing is, we’re not frogs. We’re people. We are made in the image of God and God has a plan for each of us that extends beyond living and loving and dying. We were made for a purpose. Our relationships – with spouses, family and friends – have significance because they are woven into the purpose that God has for each of us. We are tools to build one another up and help each other down the God-given road. So even if we don’t all make it back to the pond; even if we get a little lost in the woods; even if we swim in that pond alone; even if we have really, really awful Fridays that turn into awful years, we are more than just lost, lonely frogs. We are children of the Living God, caretakers of His world. We are His hands to the poor and His voice to the lost. We are His ambassadors and His soldiers. We are His people. And that means the mess ups and the failures and the bad days do matter, but only inasmuch as they draw us closer to Him, showing us our need for His grace, and reminding us that His love and his power to heal and make us whole does not come and go with the seasons. This entry was tagged bullfrogs, Czech Republic, faith, Fridays, friendship, God, life, purpose, relationships, Spring. Bookmark the permalink.